The national leader of the Peoples Democratic Party (PDP) and the Senate President, Dr Bukola Saraki, has met with the 10 PDP governorship aspirants in Kwara state to decide on a peaceful process of selecting one candidate among them in Sunday primaries. 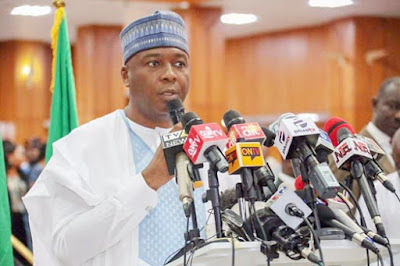 The meeting, which lasted close to one hour, was held behind closed doors at the private residence of the Senate President in Ilorin between 10:20 pm and 11:05 pm on Monday night with nine out of the governorship aspirants in attendance. The aspirants at the meeting include Alhaji Mohammed Ajia Ibrahim, Senator Shaaba Lafiagi, Alhaji Ladi Hassan, Mallam Bolaji Abdulahi, Hon. Razaq Atunwa, Hon. Ahman Pategi, Dr. Ali Ahmad, Alhaji Saka Isau (SAN), Professor Sulyman Abubakar, while Hon. Zakari Mohammed was absent. Also in attendance was a former deputy governor of the state, Chief Joel Ogundeji, while the party’s state chairman, Alhaji Kola Shittu as well as Secretary, Alhaji Abdukrazaq Lawal joined few minutes to the close of the meeting. Speaking with journalists at the end of the meeting on behalf of others, Lafiagi said that the meeting was convened to ensure peace as members of a family, adding that contestants agreed to ensure a transparent race during the primaries. Lafiagi, who represents Kwara North in the Senate, said that there was no discussion on consensus candidacy, adding, however, that the issue could not be overruled. “The meeting was all about bringing the family together. It is only normal that at a time like this the leader of the family meets with us to keep peace and ensure that all went well. We met to respect the outcome of the primaries, to ensure that we remain friends after the primaries and ensure peace. We will surely accept whoever emerges. The intention is that the contest should be free, fair as much as possible. Whoever emerges we will all line up behind him and we will remain members of the family. “I don’t know about consensus, time will tell but for now everyone is preparing to enter the contest but I don’t rule out possibilities of consensus arrangement. Along the line, we may consider that as a family. We don’t need to sign an undertaking because as I told you we are members of the same family”, he said. Also speaking, chairman of the party, Engineer Kola Shittu said that he would not know if a particular aspirant had been adopted among the aspirants at the meeting, adding that he was yet to be briefed on such as he joined the meeting midway. He also hinted that the governorship primary might hold on Sunday ‘tentatively’. However, many of the governorship aspirants betrayed emotion as they appeared moody, but wrapped it up in smiles and banters with journalists in attendance.